Roger Harris, CBE, was a well-respected and much-loved businessman in Plymouth. 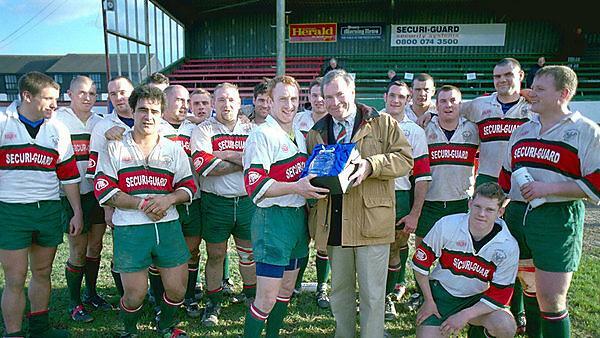 As well as being a high-flying accountant for KPMG, he was also the former president of Plymouth Albion RFC, and the president of the Plymouth Area Business Council. Roger was sadly diagnosed with a brain tumour in 2017 and lost his battle with cancer on Sunday 29 October. The Roger Harris Fund has been established by the Peninsula Medical Foundation and the University of Plymouth to support the research that will help develop treatments and, ultimately, a cure for this cancer. We have ambitiously set out to raise £274,000, the amount needed to fund 100 days of cancer research in Plymouth. As a mark of this significant achievement, and of Roger's life, a laboratory will be named after him in the University's Derriford Research Facility. Sadly survival rates from brain tumours today are poor, only one person in five is alive five years after diagnosis. This is because research has been underfunded in the past. The University is one of only four UK Brain Tumour Research Centres of Excellence in the UK, unique in its focus to discover treatments and cures for low-grade brain tumours. Low-grade brain tumours grow slowly and our research team, led by Professor Oliver Hanemann are getting closer to understanding why some become cancerous. There is a real drive to move from laboratory-based research into translational research as quickly as possible and to trial new drug treatments with patients. By remembering the Peninsula Medical Foundation in your Will, you can help the good work live on. "We focus on meningiomas, the most frequent primary brain tumour alongside other low grade tumours. These tumours develop in the layers of tissue that surround and protect the brain and spinal cord and, they progress from low grade to more dangerous forms of cancer or the brain and/or nervous system. No one knows why these slow-growing tumours become malignant, but it's a question we're getting closer to answering. We need to raise £2,740 a day to cover the cost of our research. I want to thank Roger Harris' family and friends for their inspiring goal to fund 100 days of research. With your donation, our research will move ahead and give hope to many patients and their families." Based in the new Derriford Research Facility, Professor Oliver Hanemann and his team's world-leading research focuses on identifying and understanding the mechanisms that make a cell become cancerous and exploring ways in which to halt or reverse this process. They are working to find new biomarkers and therapeutic targets for low-grade brain tumours, to test new drugs and to investigate how existing drugs could be re-purposed as therapies for brain tumours. Currently there are no effective chemotherapy or drug treatments for meningiomas of any grade, so this research is vital. Find out more about Professor Oliver Hanemann and his team's research. KPMG in the city gave him much fulfilment and pleasure. Over the years he held many other roles across the city – too many to name – and gave so much of his time for the benefit of this region. Above everything I remember Roger for his intellect, integrity and sense of humour. It was a tremendous blow to us all when we lost Roger to a brain tumour. When I learned that world-leading research into brain tumours was happening right here in Plymouth, it seemed fitting to try and do something in his memory. I hope you will join me in the fight against cancer, by funding an hour, a day, or even a week’s research, right here in Plymouth." "This year, I’m partnering with the Peninsula Medical Foundation and the University of Plymouth to raise funds for brain tumour research in Roger’s memory. When Roger was diagnosed with a brain tumour he characteristically wanted ‘no fuss'. But together we must work to find a cure and treatments for cancer, such a dreadful disease. Today, another 44 people will learn they have a brain tumour. My hope is that this research will make a difference to their lives. The University is recognised as a Brain Tumour Research Centre of Excellence. It is one of only four in the UK with a unique focus on low-grade brain tumours. Professor Oliver Hanemann and his dedicated team of researchers at the Institute of Translational and Stratified Medicine HQ are carrying out world-leading research to discover treatments and ultimately, a cure for brain tumours. Join us this March in the fight to raise awareness and vital funds to help save lives.